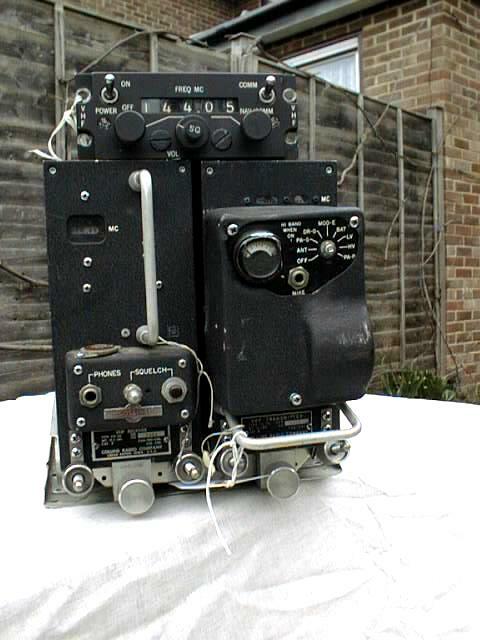 VHF Aircraft radio set made by Collins Radio Co. The radio set consists of , R-1123A (51X2B) receiver, T-879 (17L-7A) transmitter, C-4074 (614U) remote tuning control and MT-2699 rack. T-879 transmitter covers 116-149.95 Mhz AM in 50 KHz steps, 680 channels, 25 watts output. 100mw side-tone level into 500 Ohms, Mic impedance 100 Ohms, Antenna impedance 52 Ohms.R-1123A receiver covers 108-151.95 Mhz in 50 KHz steps, 720 channels. Sensitivity 3uv, 500 Ohms audio, Antenna impedance 52 Ohms. C-4074 Remote tuning control has frequency selector with mechanical digital frequency display, on/off switch, and volume control.Both T-879 (17L-7A) transmitter and R-1123A (51X2B) receiver, use a combination of tubes and transistors. Power requirements are 27 VDC @7.5A, using maximum transmitter power.